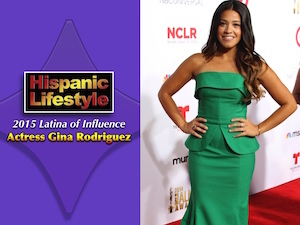 Actress Gina Rodriguez is a 2015 Latina of Influence named by Hispanic Lifestyle. Gina is being recognized for her passion to entertain, educate and inspire. In this segment the Golden Globe winning actress talks about her role in the CW series Jane the Virgin. Hispanic Lifestyle’s 2015 Latinas of Influence will be recognized during a luncheon held in their honor on at Latina Conference 2015. After many years of success and work in NY, Gina booked a lead role in a feature film GO FOR IT along side actress Aimee Garcia in which she received a 2011 Imagen Awards nomination. Shot in both Chicago and LA, once shooting in LA began, it was clear the move to the west coast was the next step for her career. Just five days after moving to California, Gina booked her first co-star role CBS’ “Eleventh Hour.” It didn’t stop there, within her first year, she went on to book series regular roles on web series “Eden’s Court” and “No Names,” and her first studio film “Our Family Wedding,” with America Ferrera, a lead in indie film SUPERCHICAS, and the ABC Family show “Ten Things I Hate About You.” Since then she has guest starred on the hit TV shows “The Mentalist,” “Happy Endings” and stars in the upcoming film CALIFORNIA WINTER among Ruttina Wesley. Now, Gina is promoting her most exciting role to date. While screening GO FOR IT (distributed by Lionsgate) at last year’s LALIFF, she had the opportunity to meet with director, Michael Olmos, and producer, Victor Teran, who had just begun to work on their project FILLY BROWN. Michael and Victor were so impressed by Gina’s performance in GO FOR IT that they had her read for the title role. Originally, the role had been written as a spoken word artist, which was an area that Gina had experience, but upon meeting, they informed her that they were considering changing the part to a rapper. After an outstanding audition, in which Gina provided an impromptu rap performance, she had secured the lead and title role. Moving at an accelerated pace, Gina was in the studio recording music for the film within a few weeks. She collaborated with the music producers, E Dub and Khoolaid from Silent Giant, to come up with over five original songs for the film. After the film wrapped, E Dub and Khoolaid approached Gina about continuing their work with her and developing her into a rap artist. She has continued working with them and has now performed in Oklahoma City, OK and Odessa, TX, opening for Bun B from UGK.